Introduction. Energy Budget Near the Surface. Radiation Balance Near the Surface. Soil Temperatures and Heat Transfer. Air Temperature and Humidity in the PBL. Wind Distribution in the PBL. An Introduction to Viscous Flows. Fundamentals of Turbulence. Semiempirical Theories of Turbulence. Neutral Boundary Layers. Momentum and Heat Exchanges with Homogeneous Surfaces. Evaporation from Homogeneous Surfaces. Marine Atmospheric Boundary Layer. Nonhomogeneous Boundary Layers. 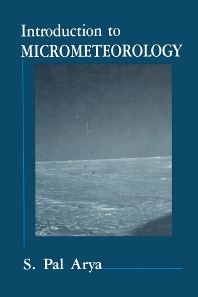 Agricultural and Forest Micrometeorology. References. Index. This up-to-date textbook is highly recommended for introductory courses offered at undergraduate and graduate levels. Coverage begins with basic fluid and thermodynamical laws and concepts, then moves on to cover such major topics as momentum and heat exchanges with homogeneous surfaces, nonhomogeneous boundary layers, fundamentals of turbulence, and more. This book introduces the reader to theoretical concepts and quantitative relations through qualitative descriptions based upon observations. Undergraduate and graduate meteorology students, boundary-layer meteorologists, air pollution meteorologists, agricultural and forest micrometeorologists, and environmental scientists and engineers. North Carolina State University, Raleigh, U.S.A.